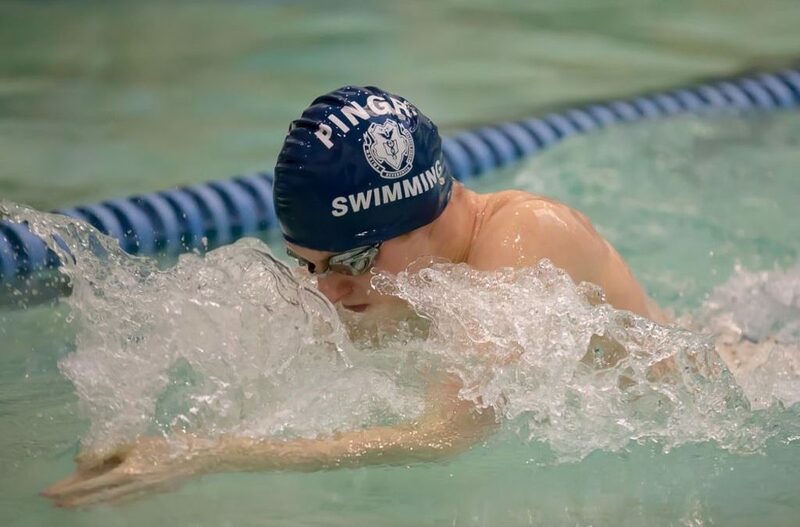 Pingry boys’ swimming has had yet another dominant season. Like last year, they’ve maintained an undefeated record, and, as senior captain Kevin Ma (VI) states, “Although we graduated an extremely strong senior class last year, we still managed to prove to everyone that we are the best team in the state.” The team’s commanding 109-61 win over Bridgewater, the next best team in the state, serves as evidence of their strength this year. Their performance earned them a first place finish at the Skyland Conference Championship, where they claimed 17 top-six swims and placed first in every relay. They also won the Prep Championships against other strong teams, including Delbarton and Pennington. In addition to their success at meets, the team’s season was filled with record-breaking swims. Individually, Matt Fallon (IV) set both new school and pool records in the 200 meter IM, 200 yard IM, 400 meter freestyle, and 100 yard breastroke. Kevin Ma (VI) also broke the Skyland Conference record for the 50 yard free. As they head into the state tournament, they hope to continue their success and add yet another title to an already impressive season.